Ontario's electrcity system operator, the IESO, posted a 2nd "estimate" for March's global adjustment charge yesterday, along with an initial estimate for April's. Both are bad - but the pricing of the last 3 months does provide some insight into Ontario's electricity sector worth pursuing. The 2nd estimate is a credit of $8/MWh - based on a total global adjustment pool of $67.7 million. The final global adjustment has not been a credit since June 2008. A credit would mean the market sales exceeded the contracted cost of supply, which might appear to be possible, as it did in February, when the weighted average Hourly Ontario Energy Price (HOEP) was $81.83; only slightly higher than March's $80.41. Applying the arbitrary global adjustment charge to make March $21/MWh cheaper than February looks to ridiculous. Were you wrong in February, or or are you wrong now? This is not a question likely to get a response from the OPA/IESO global adjustment team. There is a near-total lack of transparency on the composition of the global adjustment which facilitates it being recklessly calculated and arbitrarily applied. The estimate for April is a credit of $9.65/MWh, but that won't be anywhere near correct. 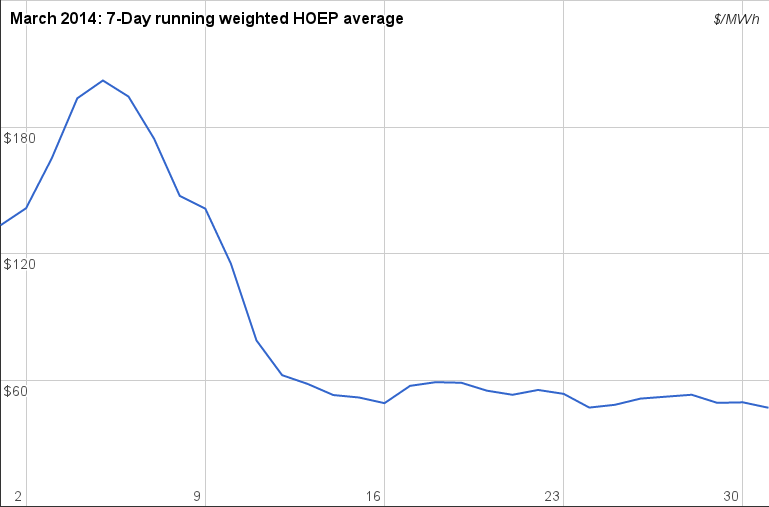 The HOEP fell back below $60 after the earliest part of March, and is likely to fall further as we enter warmer weather, lower demand, and frequent periods of surplus baseload generation (SBG). It's important to remember that billing is done on the global adjustment "estimates" (see the Global Adjustment/Ontario Roulette story); portions of April consumption billed in April will have a credit, but use in April billed in May will probably be at least $40/MWh more. Generally the final global adjustment numbers come to make sense over a period of time - if March is low, April, May, etc. will be high. While March's numbers are so bad they'll distort the entire quarter, there's some important messages that come through regardless. Higher market prices don't, by themselves, lead to higher pricing for the vast majority of ratepayers. In fact, higher market prices ease the cost burden of supporting cheap exports, and providing cheaper supply to the province's few very large consumers of electricity (class A). I wrote in a previous post; "Residential and small business consumers are not likely to see rates rising substantially quicker than they have been due to natural gas pricing." We've passed the high winter pricing for that fuel now, and, conversely, consumers will likely start to see rapid rate increases - as they did last summer. 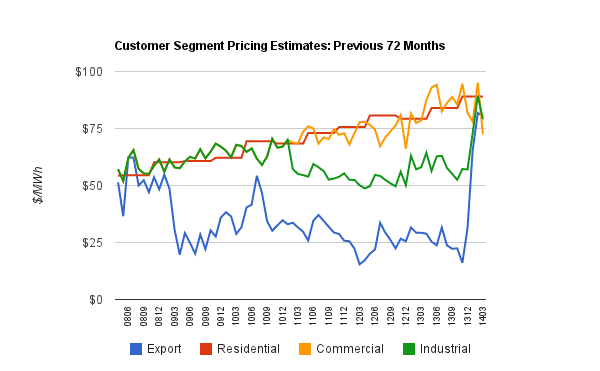 I have updated the supply costs and Preliminary Monthly Report pages on my data site.